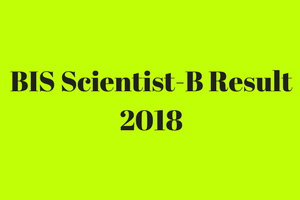 BIS Scientist B Result 2018 – Examination of 15th April has been cancelled. The result of the Scientist-B Written Exam & Expected Cut Off marks will be announced on behalf of Bureau of Indian Standards, after the commencement of the two step tests-online test and interview. BIS is basically a statutory National Standard Body under the Ministry of Consumer Affairs, Food and Public Distribution, Government of India. The online examination was scheduled to be held on 15th April 2018. Later the board has cancelled the exam through notification. Since the date of the publication of result has not been announced so the candidates need to check the online portal of BIS which is www.bis.gov.in from time to time to stay updated. Also read – BIS Scientist B Previous Years Question Paper. BIS Scientist B Admit Card Hall Ticket Download. Organisation Bureau Of Indian Standards. Name of the posts Scientist B. Exam Date 15th April 2018 New dates not announced. The recruitment for the post of Scientists-B will be made as per the merit list. These posts are in the Pay Level 10 according to the Seventh Central Pay Commission. The candidates need to undergo two steps selection process to get shortlisted for the appointment of Scientists-B. At first there will be online test conducted to check the knowledge of the candidates. The candidates must score good marks in the test. Those who will score better will able to get a place in the Merit list and get a call to appear for the Interview round. This is to be mentioned specifically that only those candidates who will score above the qualifying marks will be allowed to appear for the Interview. The Bureau of Indian Standards Scientists-B final Merit list will be prepared on the basis of the performance of the candidates in the online examination as well as the Interview round. The documents of the candidates will be verified during the course of the entire selection process. Once the merit list gets prepared, it will be uploaded to the official website of BIS www.bis.gov.in and the candidates will be able to check it from there, putting their roll number or registration number. Textile Engineering & Fiber Science 03 Posts. Bureau of Indian Standard Recruitment 2018. The recruitment authority of BIS has not announced the qualifying marks for the recruitment process -online test or interview. It can be concluded in this regard that selection of the right candidates for the post of Scientist-B will be made abiding by the merit list.